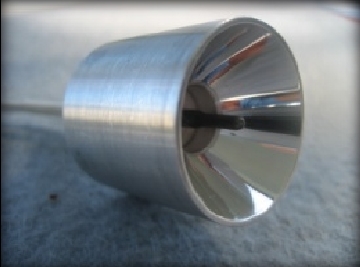 The coiled filament operates at approximately 975˚C when powered with 11 watts for the ASB-IR-12K and 1200째C when powered with 20 watts for the ASB-IR-18K. 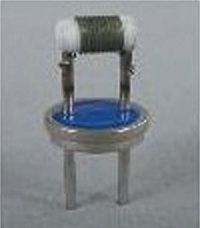 The radiating element of the ASB-IR-12K is a coil of resistance wire which has a high emissivity in the Infrared spectral region. The coil is supported on a grooved cylindrical substrate of alumina, resulting in the windings being electrically insulated from each other. This contributes to a more uniform radiating source. The unit does not require operation in a sealed atmosphere. The header is fabricated from cold-rolled steel. The support pins are hermetically sealed in glass. The ASB-IR-18K is designed for those customers who require higher temperatures and greater output from their infrared source. These emitters are manufactured using a patented silicon nitride material. The advanced ceramic technology ensures a very stable product. Their robust design ensures intrinsic physical and thermal strength. When operated at 12 volts/20 watts the ASB-IR-18K reaches 1200˚C. These silicon nitride emitters are mounted in a 1 inch parabolic reflector for extremely efficient collimation of energy. This unit is our highest output IR product.